One of the Best Buggy Focus Group turned to me today and said: “The Peach Jogger is the prettiest pushchair in the whole world”. I stopped and thought about this for a while, and I have to say I agree. There is something stunningly beautiful about the iCandy Peach Jogger – the chassis is solid and rounded and looks smart with its matt satin finish; the three chunky air tyres give a feeling of solidity, but also add to the rounded feel; and the beautiful soft sheen fabrics surrounded by the aluminium really do make the Peach Jogger stand out from the crowd. However the Peach Jogger doesn’t just have great looks – it is a practical, work-horse of a pushchair. The Peach Jogger has a tall, wide seat which comfortably can hold our tall 4 year old. The seat is comfortable, especially with a liner in, and the deep hood will offer good shade in summer and help keep a child snuggly in winter. There is a large basket which can take a good amount of shopping, or everything needed for a day trip. The Peach Jogger has a neat fold which doesn’t fill your boot up – in fact a Peach Jogger is one of the few off road pushchairs that will fit into the boot of a Mini. On top of all that the Peach Jogger feels fabulous to push – the air tyres really make a difference compared to the standard Peach. What is the difference between the Peach and the Peach Jogger? At this point I should say that we have previously had two iCandy Peach pushchairs. As you might expect, the Peach Jogger is very similar in the way it functions and anyone who has had a Peach will more or less know how it works. Therefore let me first identify the differences between the standard Peach and the Peach Jogger. The main difference is that the Peach has 4 EVA foam no puncture wheels whereas the Peach Jogger has 3 pneumatic air tyres. The rear Peach Jogger wheels are 11 inches and the front wheel is a slightly smaller 10 inches and swivels or can be locked straight. iCandy have thoughtfully provided an air pump which is encased in a small pocket in the bottom of the basket. Great touch! If you like 3 wheels, but hate punctures, then iCandy now do Peach Jogger EVA tyres as an accessory, for an additional £75. The other obvious difference is that the Peach has a shiny chrome chassis. The Peach Jogger has a more matt satin finish. At first I wasn’t sure about the finish, but I probably now prefer it! The chassis does look very smart. Due to the Peach Jogger being a 3 wheel pushchair, there is a ‘nose’ piece which houses the front wheel. If the front wheel is removed, the ‘nose’ then folds underneath the chassis, thus offering an even neater fold. It also gives older children somewhere to place their feet which I think gives the Peach Jogger greater longevity of use than the Peach. Older children seem to look really comfortable in the Peach Jogger with their feet on the ‘nose’ as opposed to using the footrest. I must say at this point, that although the name implies the Peach Jogger is suitable for jogging with, we would not recommend that you run with this pushchair. 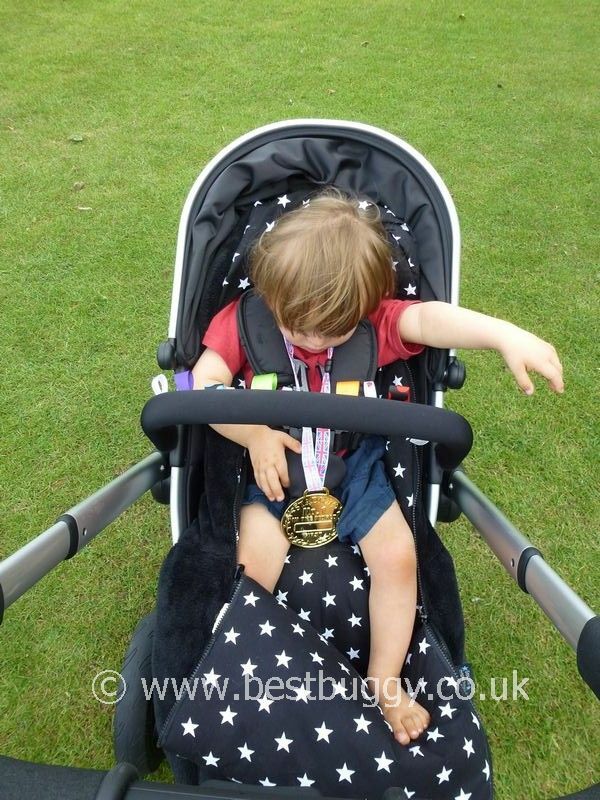 If you wish to run with your child once it is 6 months old, then seek specialist help to choose the correct pushchair for running with. The Peach Jogger seat is beautiful to look at. The fabrics of are quite different to those that we had on both our Peaches. It is more shiny with a silky feel. I like how soft the shoulder pads feel next to my son’s face. The crotch pad is huge! I think the largest crotch pad that I have seen on a pushchair. However the fabrics do seem to crease easily especially on the hood. The seat is lightly padded but there is the choice of an optional liner, which for a younger child really is worth getting to “fill” the seat, as the seat is a generous size without a liner. The liner not just adds padding but will protect the seat fabric – its easier to wash the liner than the seat (as the seat fabric can’t be removed). Equally the footmuff could be used instead of a liner with the top zipped on in winter but removed in summer. I like the way the lower part of the footmuff gives a mini carrycot feel! The Peach Jogger seat can both parent and forward face. There are also three recline positions – upright, semi reclined and a horizontal recline. This is achieved by first pressing in the two inside buttons on the side of the seat; and then reclining the seat. This recline system is probably one of my few niggles with the Peach ie it means you need to stop the pushchair, lean over the child with both arms and press the buttons with a finger and nudge the recline with your thumbs at the same time! Its not a big issue but there are easier recline systems around. The seat is a bucket seat and therefore is only suitable for a baby older than 6 months. 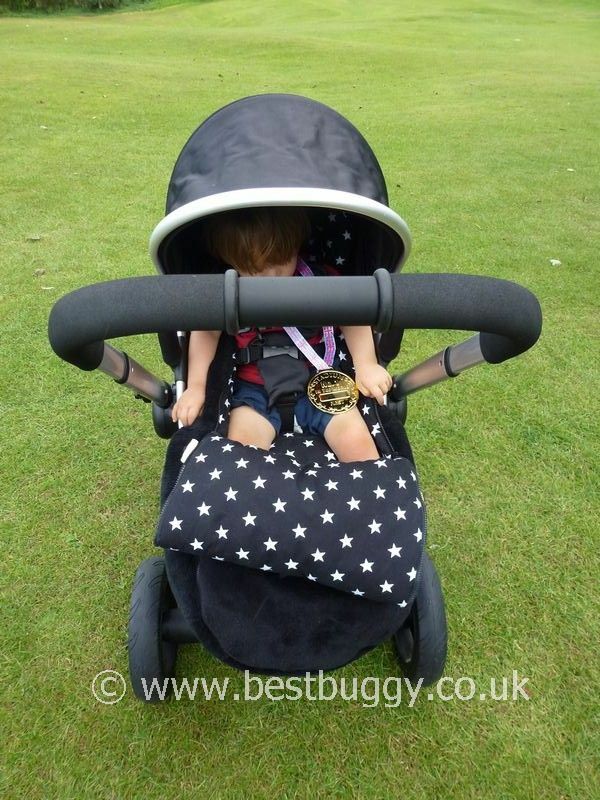 The Peach Jogger has a beautiful carrycot which is available to buy for a newborn baby. A Maxi-Cosi Pebble or Cabriofix car seat can be used with the addition of optional car seat adaptors. The footrest is adjustable to several positions to lift up give comfort for a sleeping child or to point down to the floor for an older toddler. The footrest area is made of a harder wearing, easier to clean material so that muddy feet are not an issue! The harness is good quality, with a strong buckle. The harness itself is very easily adjusted – one of the best things for us because we often switch between children. The harness is a good length and can be made small for a 6 moth old, and has plenty of length for our 4 year old. The Peach Jogger comes with a bumper bar. However although the bumper bar can be removed; by pressing two buttons in and pulling; it is a fixed ie not gate opening bar. However the Peach Jogger is not really a pushchair where a child can climb in on their own as the seat is quite high, so we have never really found this an issue as we just lift the child over the top. The Peach Jogger has a very sturdy chassis – it is well built and feels strong. I love the thick frame and the chunky dense foam covered handlebar. The way the Peach Jogger feels in your hand is unlike any other pushchair. It feels great! I push a lot of pushchairs, week in and week out, but we always have a Peach / Peach Jogger here. I love returning to use the chunky handle of the Peach / Peach Jogger! One of the good things about the Peach Jogger is how everything clicks reassuringly into place – you are always sure the chassis is open, or the seat is locked into place. I like how the side function buttons pop up or down decisively. The only sound I am not keen on is the clicking noise as the hood is pulled up or down….it does feel rather loud when you have a sleeping baby in the seat!! In the centre of the handlebar is a button which when squeezed allows the telescopic handlebar to be raised or lowered. There are 4 handlebar positions ranging from 95cms to 106cms. The handlebar button also forms part of the amazing Peach Jogger fold. To fold the Peach Jogger, first remove the seat unit by pressing in the two outer rings of the side buttons – one at either side below the bumper bar. As you press the buttons in, the seat lifts off easily. However the two buttons also have a memory function so that one can be pressed in, then the other can be pressed independently, before pulling the seat away. Next squeeze in the handlebar button and jab the handlebar towards the front wheel – the movement needs to be as if you are travelling along the diagonal line of the chassis. This movement then “breaks” the chassis. When this happens (and sometimes it can take a couple of attempts), then grasp the carrying handle and pull the Peach Jogger upwards towards you and the chassis will fold without the pushchair hitting the floor! To make the folded Peach Jogger even neater, simply lie the pushchair down on the ground. Press in the square button on the front of the front wheel socket, and the wheel will tug out of its housing. The front ‘footplate’ can then be folded by pressing on two small buttons. The rear wheels can easily be removed by pressing in the centre of the wheel hubs and pulling them off. The Peach Jogger chassis is compact even with the wheels on – 3 wheel off road type pushchairs have a reputation for being large and cumbersome when folded – not so the Peach Jogger! It is actually possible to fold the Peach Jogger one handed – as discussed the side buttons do release the seat independently, so one side, and then the other side of the release mechanism can be done. The seat then tugs off using the bumper bar and the seat can be placed on the floor or even slung over an arm whilst the chassis is folded. The chassis can then be slung over a shoulder. So although the Peach Jogger is a 2 piece fold, it is actually more managable than some one piece folds for getting on public transport with a baby under one arm! I also find that having two parts makes you think about which direction you want your child to face for any outing and its easier to start with two pieces than to have to remove a seat from a one piece fold pushchair and turn it around! Plus having two pieces means that they slot better into a car than one chunk of a pushchair. However I know the author of the opening quote begs to differ, because she ended up selling her Peach Jogger due to the 2 piece fold. She was struggling to store the Peach Jogger in her house in 2 pieces. There is a locking catch on one side which is easy to apply and remove, although really you need two hands to manage the chassis and apply the lock. But the Peach will stay fairly well closed without the lock as long as it is slung onto your back or held by the shoulder strap. Opening the Peach Jogger is just as easy one handed. The Peach simply flicks open and the seat unit then can be dropped easily on top and pushed on until it clicks. We have an issue with the fold, and that is that the wheels are rubbing on the sides of the handlebar when folded thus leaving a dirty mark on each side. The Peach Jogger has a neat brake situated in the centre back of the lower axle. It is simple to flick on and off, even bare footed. It feels decisive and visually you can see that it has been applied. The Peach Jogger is amazing to push across grass, cobbles, bumps and uneven surfaces. We have taken the Peach Jogger easily across the wet, dry and thick sand on the beach, as well as straight over banks of cobbles. The Peach Jogger is equally at home in smooth shopping malls, however it is not quite as responsive as the Peach because of the larger front wheel. When you stop eg to look at a display, the front wheel needs a wiggle to get it straight to get going. This is fairly usual with 3 wheel / larger wheeled pushchairs. However should you need to push the Peach Jogger on a camber, or to park on a hill then the Peach Jogger can be extremely tippy (not an issue on a flat surface). On one outing I really struggled to keep the Peach Jogger upright whilst I took my son out and put him in the car. The car was parked on a slight slope. I had to be very careful pushing the Peach on cambers – with care we were ok, but its is something to be aware of. What really stands out about the iCandy ranges, but especially the Peach range, is the quality. 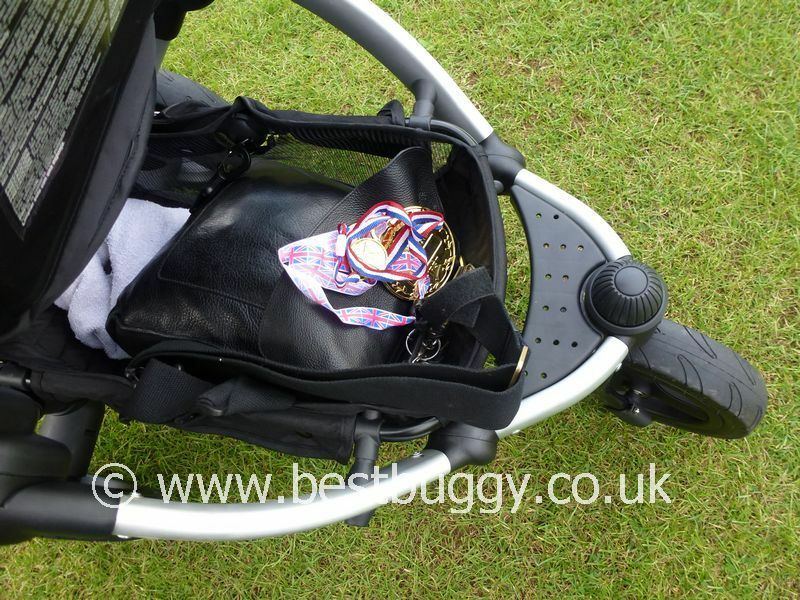 The Peach Jogger is a high end, top quality pushchair. Yes it is expensive, but it is worth every penny. The 2 year warranty is worth having too. All round, we love the Peach Jogger. It works very well; its very practical; it has been great when we have used it off road and it looks great. The Peach Jogger is one of the few pushchairs that stays with us here at Best Buggy HQ long term, which probably says a lot about how much we like it.